Krabi Thailand, is one of those perfect destination beyond Phuket for visitors that are in search of a more laid back and relaxing holiday. 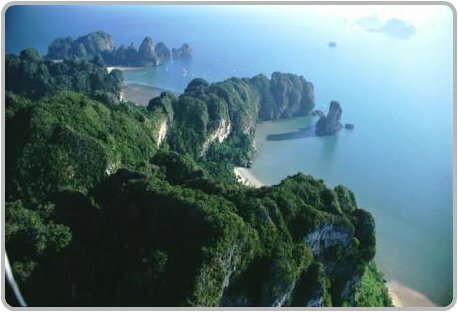 Krabi is an ideal spot for family vacations, romantic getaways or eco-tourism vacations in southern Thailand. 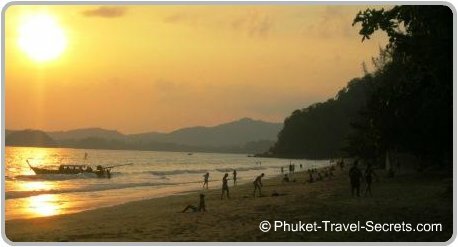 Let us take you beyond Phuket for a while to Krabi, so we can share with you travel tips and holiday vacation ideas. Throughout these pages we will share with you tips on the bests spots, top beaches, attractions and activities that we found during our family vacation in Krabi Thailand. Krabi is located only a few hours by road or boat from Phuket and is a must see destination when traveling throughout Southern Thailand. 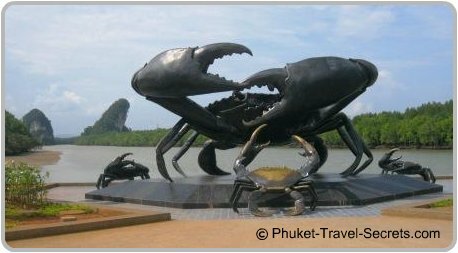 Some visitors choose to take day trips from Phuket to Krabi, however there is so much to see and do. It would be an injustice not to spend a couple of nights in this hidden paradise. Known as the "Emerald of the Andaman”, Krabi is surrounded by spectacular natural beauty. From secluded beaches fringed by towering limestone formations, waterfalls and caves to a coastline dotted with bays and tropical offshore islands, and some of the most bizarre rock formations imaginable. Much of Krabi Thailand is designated as National Park and is bordered by Phang Nga, Surat Thani, and Trang provinces. The largest being Hat Noppharat Thara National Park which takes in many of the popular mainland beaches, including Noppharat Thara Beach, Ao Nang, Tonsai and Railay Beaches, as well as the popular Phi Phi Islands and over 80 smaller islands. At the southern most point of Krabi province is Koh Lanta National Marine Park, which includes several coral-fringed islands, and well-known diving sites. There are also several National Parks throughout the mainland of Krabi, providing an interesting range of inland attractions that are definitely worth exploring. Some of these attractions include waterfalls and caves, hot springs and rock pools, nature reserves and walking trails. Whilst Krabi main attraction is the unspoiled beaches and offshore islands there are some interesting attractions to be seen on land. Some of the best attractions to explore in and around Krabi Thailand include the iconic landmark Khao Khanap Nam where you will find caves containing impressive clusters of stalagmites and stalactites. Wat Tham Sua also known as the Tiger Cave Temple serves as a religious site for the monks, it is also a place of archaeological and historical interest where stone tools, pottery remains, and the moulds for making Buddha footprints have been found in excavations. The Gastropod Fossil Site also known as Susaan Hoi, Shell Fossil Beach and the Shell Fossil Cemetery, is an interesting attraction to visit, the site features fossilized shells that date back over 75 million years. Krabi Thailand is a great destination to just kick back and relax, or an adventure playground for visitors who want to get out and about. Most activities and things to do in Krabi are based on eco tourism. There is a great selection of cheap bungalows, guesthouses, hotels and resorts in Krabi to suit all budgets from cheap accommodation to luxury 5 star resorts and hotels. Most of the resorts and hotels in Krabi province are located around the popular beach areas of Ao Nang, Railay, Phra Nang and Nopparat Thara Beaches with boutique hotels and guesthouses in Krabi Town. 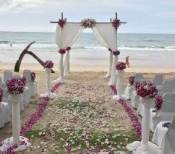 There is also a good range of upmarket five star resorts and boutique hotels on the unspoilt northern beaches of Klong Muang and Tubkaak beaches. These northern beaches ooze peace and tranquility and are so different from the main tourist area of Ao Nang. If you are traveling with kids there is no need to worry about what they will eat in Krabi. As there is an abundance of places to eat from street side vendors and markets to outdoor cafes and a fantastic variety of good restaurants. And if all else fails there is a selection of fast food chains including McDonald's, Burger King and Subway around Ao Nang that will save the day. Shopping in Krabi is definitely more laid back then in Phuket, the shop owners for some reason don’t seem to be as pushy and the whole shopping experience is much calmer. 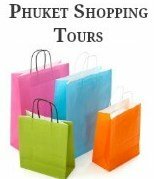 The best shopping areas are in Krabi Town or at Ao Nang. The nightlife in Krabi is nothing like the night time entertainment that you find in Phuket, it is much more subdued. Apart from the nightlife on Ko Phi Phi, Ao Nang is the main tourist hub in Krabi Thailand, and provides a vastly scaled down version to the nightlife activities in Patong. Krabi boasts its own International Airport making it very easy to get to, as well as having bus and ferry services that are readily available. Once you have arrived getting around Krabi is also relatively easy with many different transport options available. For travelers that are stretched for time but would like to go to Krabi from Phuket for a day trip, the quickest way to get there would be to charter a speed boat from Phuket for the day. This way not only do you get there quicker you will see the beautiful offshore islands on the way as well as the best beaches in Krabi.